Over the years, Consumerist has reported on student loans and the crippling impact their debt can have on recent graduates. But with rising tuition costs and financial aid opportunities becoming increasingly competitive it’s easy to see why student loans are a necessity for entering college. A new report claims that overall loan delinquency rates are declining, but a closer look at the numbers may reveal a problem that is much worse than previously believed. The FRBNY report [PDF] notes outstanding student loan balances increased to $1.08 trillion as of Dec. 31, representing an increase of $114 billion for 2013. In fact, student loan debt has tripled from a decade ago; an unsurprising figure considering tuition continues to increase year after year. Today, 71% of students leave college with an average of $29,400 in student loan debt. According to the report, nearly 11.5% of student loan balances are 90 or more days delinquent or in default, down from 17% in a 2012 study. The student loan delinquency rate given in the Fed report is only slightly higher than the 9.5% reported for credit card delinquencies. However, can these two forms of debt be subject to an apples-to-apples comparison? As the Credit.com story points out, credit card debt is effectively owed by all cardholders at any given time. There are monthly minimums required by credit card companies, but that’s very different from monthly loan payments by student loan borrowers who are generally supposed to repay their debt according to a set schedule over the course of many years. Additionally, many student loan borrowers are receiving funds from lenders for years before they are obligated to pay it off. According to Credit.com’s analysis of the data, nearly half of the $1.2 trillion of education debt that’s currently on the books belongs to students who are still in school, and thus not yet required to make payments. So in reality, the total amount of loans delinquent by 90 or more days is about 23%, more than double what the report shows. However, Credit.com says the number doesn’t give a full picture of student loan repayment troubles, since the FRBNY report excludes information for loans that are less than 90-days delinquent. 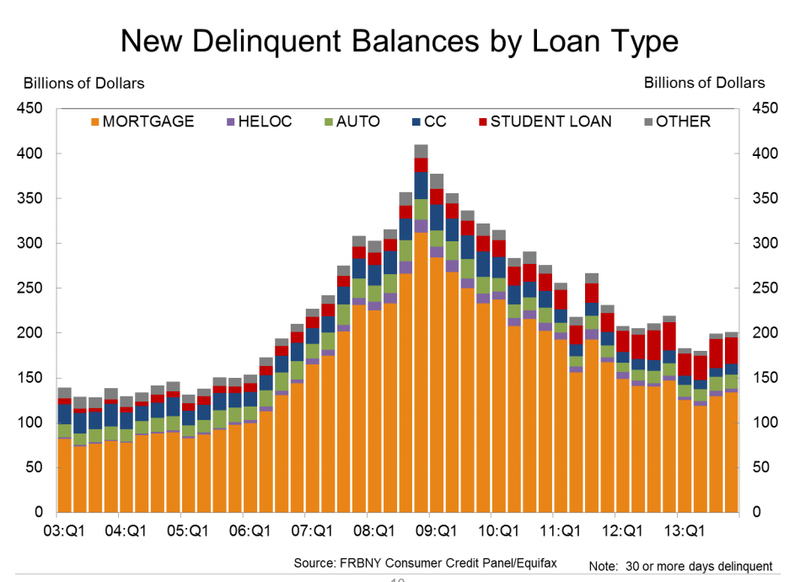 By using the report’s “New Delinquent Balances By Loan Type” graph (click image on the left for full-size), Credit.com was able to conclude that an additional 5% of student loans are 30 or more days delinquent. So, in total, nearly one-third of the $600 billion in student loans that are currently in repayment mode could be considered delinquent. With such a high delinquency rate, it should come as no surprise that student loan debt has had a negative impact on borrowers’ credit scores. And FICO was right, the dark cloud has seeped its way into other economic areas. Earlier this year, the Consumer Financial Protection Bureau reported that the housing market has already been affected by potential home owners student loan debts. With mounting student loan debt there are fewer first time home buyers than in previous generations. The problem is magnetized by a new federal regulation that went into effect in January. The rule gives mortgage lenders broad legal protections as long as they do not approve loans for buyers whose total months debt exceeds 43% of their monthly gross income. So, how did student loan delinquency get to this point and what can be done? Credit.com theorizes that the problem stems from a combination of reasons. First, at least one-third of all the loans that were made should not have been approved in the first place. Second, the servicers’ goals are different from borrowers. When troubled loans require restructuring or modification, Credit.com speculates that the servicers don’t take action because it would be in contrast to their investors’ needs. Student-loan borrowers are suffering through substandard customer service, half-baked solutions that are crammed down their throats and one-sided contracts that limit their recourse. Their plight is real, the problem is growing and the need for action is urgent. 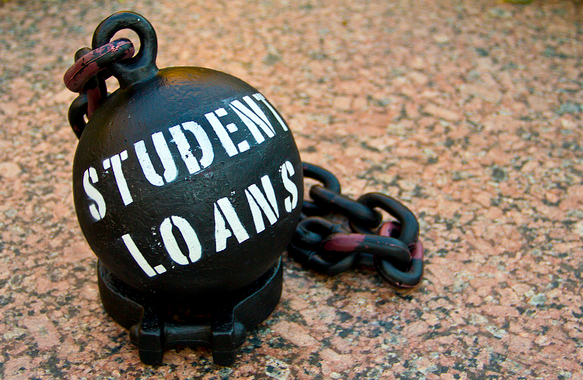 Last November, consumer advocated took a look at problems within the student loan industry. They eventually called for a complete overhaul which would provide better resources for comparing loan options and helping students and families understand the consequences of borrowing such large amounts. While a solution for student loan debt delinquency doesn’t appear to be imminent, Credit.com says a good starting point is to capture and properly analyze all pertinent data to show how truly bad the problem is.